(LS126-12) Large plot of land for sale Suitable for investment in Luang Nuea, Doi Saket. (LS276-13) Large plot of land with good access, Doi Saket. (LS277-11) Land suitable for investment, mountain view, Nong Yaeng, San Sai. 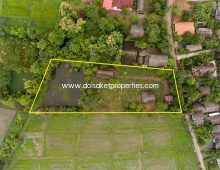 (LS278-05) Stunning plot of land for sale in Pa Pong, Doi Saket. (LS287-01) Land surrounded by nature, view of fields and mountains Sa-Nga Ban, Doi Saket. (LS280-01) Plot of land for sale in Mae Pong, Doi Saket. (LS281-03) Stunning plot of land ready to build. (LS289-02) Paddy fields for sale surrounded by fields and mountains views. (LS268-02) Land for sale in a prime location Choeng Doi, Doi Saket.